We’ve had our heads down these past few weeks, so though we’ve made a lot of progress on the game we haven’t had time to tell you about it. To address this I thought it might be fun to link our source control system to twitter, so when we submit a change to the project you can read about it. I asked Rudolpho, a helpful pack mule from the game, to transcribe each message by hoof. So far he’s done a fantastic job. Great work, Rudolpho! 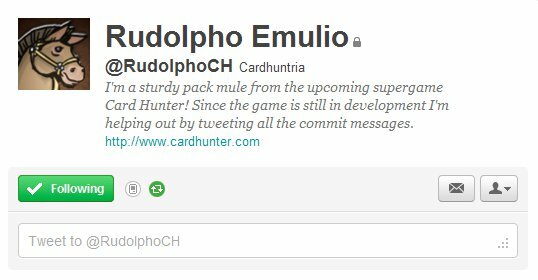 You can find his twitter feed here, where in amongst the bugfixes and tweaks you’ll catch glimpses of adventures, characters, and game mechanics. Ha ha, that’s actually kinda cool. Good to hear you guys are hard at work. We’re all still as eager as ever. Can I ask what source control software you are using and any extra clients you needed to set this up. It’s super awesome. Yeah sure. We use SVN, and I wrote a little custom python script in hooks/post-commit that pulls the last commit data via svnlook, reformats it into tweets w/ @ tags, and publishes it via tweepy. I mean, we asked a mule to retype each commit message. Thanks, that’s awesome, the game dev I work uses SVN as well so I think we might try and implement this.